Implementing and consuming Machine Learning at scale are difficult tasks. MLbase is a platform addressing both issues, and consists of three components -- MLlib, MLI, ML Optimizer. ML Optimizer: This layer aims to automating the task of ML pipeline construction. The optimizer solves a search problem over feature extractors and ML algorithms included in MLI and MLlib. The ML Optimizer is currently under active development. MLI: An experimental API for feature extraction and algorithm development that introduces high-level ML programming abstractions. A prototype of MLI has been implemented against Spark, and serves as a testbed for MLlib. 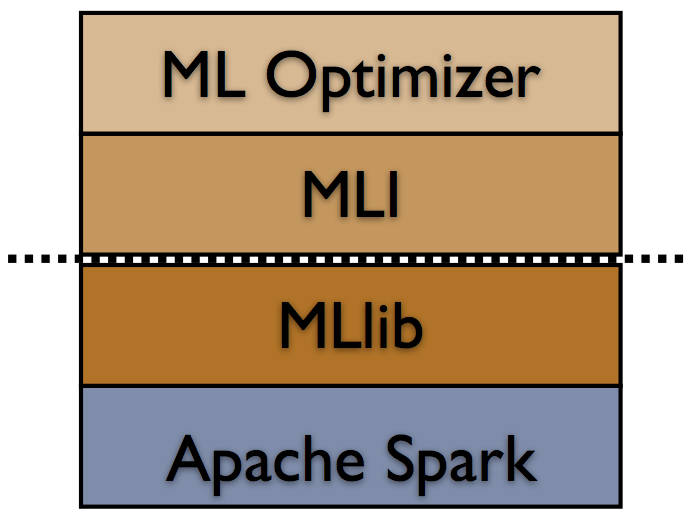 MLlib: Apache Spark's distributed ML library. MLlib was initially developed as part of the MLbase project, and the library is currently supported by the Spark community. Many features in MLlib have been borrowed from ML Optimizer and MLI, e.g., the model and algorithm APIs, multimodel training, sparse data support, design of local / distributed matrices, etc. MLbase is an open-source project developed by the AMPLab at UC Berkeley.